Emergency services were called to Heron Way in Granton, Edinburgh, on Monday. Granton: Seven appliances have been called. 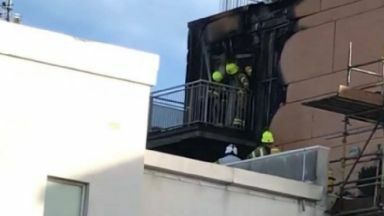 A fire has ripped through a high-rise block of flats, forcing residents to be evacuated. Emergency services were called to Heron Way in Granton, Edinburgh, at 9.30am on Monday. Around 35 firefighters are tackling the flames while residents have been evacuated. Those living in the block have been told they can use facilities at the Royston Wardieburn Community Centre. A Scottish Fire and Rescue Service spokesman said: "We have been called to a building fire. "We aren't sure how bad it is. "The building has eight floors."